Safe routes to school programs support schools and communities in their efforts to get students biking and walking to their campuses. The benefits of walking and biking to school include reduced traffic congestion, increased physical activity, and bringing together a community. Studies have shown that active children tend to have better academic achievement, enhanced concentration, and better classroom behavior. A Safe Routes to School program employs five main components: education, encouragement, engineering, enforcement, and evaluation. 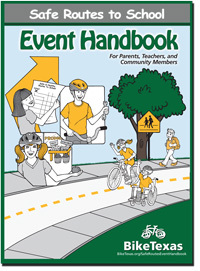 The BikeTexas Safe Routes to School Event Manual gives parents, teachers, and youth community leaders the tools and resources to organize a bike and walk to school day and other bike/walk events for their school and community. A BikeTexas SafeCyclist Certification Training provides teachers and youth community workers with bicycle and pedestrian safety skills and the curriculum needed to teach these life saving skills to their students. 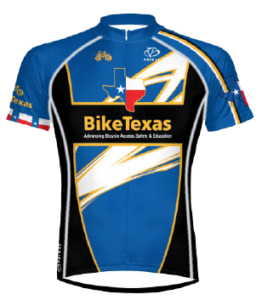 The BikeTexas SafeCyclist Curriculum is a comprehensive bicycle and pedestrian safety education curriculum designed for fourth and fifth grade elementary students. This 15 lesson curriculum serves as the critical “Education Component” of a well-rounded Safe Routes to School Program. The lessons focus on rules of the road, safe cycling skills, strength building and stretching using fun physical exercises. 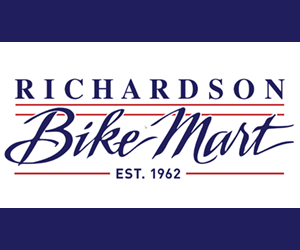 These activities aid physical education teachers and coaches in integrating bicycle safety education into their Physical Education objectives. The SafeCyclist Teacher Master Pages – helpful for health fairs, bike rodeos, and more – are available for download and print. The Safety Bling! Music Video features comic rap duo The Rhymanese Twins, aka Jon Steinmeier and Noah Tabakin. This hilarious two-headed, three-legged rap team pumps out the BikeTexas safety message with phat beats, a hysterical, while educational plot line, and the help of rival UT and A&M college students on bikes.